Denise was raised in the Bronx, the only daughter of six children of Denis and Elizabeth (McSweeney) O’Flynn. Her father was born in County Cork and her maternal grandparents immigrated from CountyClare. Denise graduated from Mt. St. Vincent with a B.A. in Business and Economics and Mercy College with a Masters Degree with Distinction in Human Resources. After 25 years in management positions at United Airlines, she is currently in Administration at St. John’s Riverside Hospital. Denise is an officer of the LAOH Our Lady of Knock Div. 19, Yonkers. She is on the Women in Business Committee of the Yonkers Chamber of Commerce and an original member of the Nine and Dine Golf League. She volunteers at the Annual Café Noel at Rosary Hill Home and the Irish Volunteers for the Homeless at the Aisling Irish Center. She is a member of the American Irish Association of Westchester. Denise and her husband, John Donaghy are parishioners of St. Mary’s Immaculate Conception Church in Yonkers where she is a Lector. Michael was raised in Yonkers, the only son of five children of Paul and Ann (MacClave) Gallo. His maternal great-grandparents immigrated from Counties Laois and Galway early in the 20th Century. After attending Iona Prep, Michael served in the U.S. Army as an Airborne Ranger from 1994 to 1999. He then became a member of the NYPD, responding to the World Trade Center on 9/11/2001. He joined the Yonkers Fire Department in 2003 and is currently assigned to Ladder Company 72 from Fire Station 9. Michael is a Board Member of the North Yonkers Preservation and Develpoment Corp. and a Committee member of the North Yonkers Scholarship Foundation. He is Co-Director, with Tony G., of the Chili Hilly 5k charity run/walk. He is a member of the Lakers Athletic Club and has coached at Christ the King and North Yonkers Boys and Girls Club. He is a member of the VFW Post 12033 Chris Engledrum Post (FDNY), and an active supporter of Army Ranger Lead the Way Fund. Michael is a parishioner of Sacred Heart Church in Yonkers. Cathy was raised in the Bronx, the first of three children of John and Noreen (Clancy) Hogan. Her father hailed from County Clare and her maternal grandparents from County Galway. After graduating from Mt. St. Ursula, Cathy attended Manhattan College. A member of Doonbeg Social Club of NY, she served as both the first woman and the first Irish-American Presidnet. She has served in a number of offices, including President, for the County Clare P.B.& S. Assoc. of NYC. 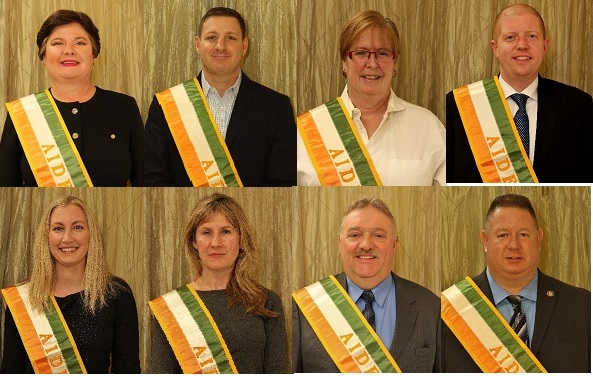 She is Secretary/Director of the Tara Circle and has served as President of the United Irish Counties Assoc., now serving on the Association’s Board of Directors and as Secretary for the annual UICANY Feis held in Yonkers. Cathy is a member of the LAOH Our Lady of Knock Div. 19 Yonkers. She was Secretary and Treasurer of the Clare Football Club of NY, and currently serves as Treasurer of the Int’l. Clare Football Supporters Club. Cathy was also an Aide to Grand Marshal Timothy Cardnial Dolan in the 2015 NYC Parade. A resident of Yonkers, Cathy remains a parishioner of St. Margaret of Cortona in Riverdale. Brendan was born in Yonkers, the second of three children of James and Nancy (Anderson) Landy. His Irish roots go back five generations to Counties Waterford, Cork and Clare. His family’s involvement with the parade started with his great-grandfather. His father was Grand Marshal in 1996 and his mother was an aide in 2007. Brendan graduated from Fordham University with a degree in Business. After working for BNY Mortgage Co., he started his career with Empire City Casino in Accounting and then Marketing. He is currently director of Marketing for Empire City. He has been involved with local organizations including serving on the Board of Directors of St. Joseph’s Housing Development Fund Corp. which provides 160 housing units to senior citizens in Yonkers, through Griffin House and Seton Manor, and over 800 units of supportive housing to behavioral health individuals in NYC. Brendan is a member of the Friendly Sons of St. Patrick Westchester, serving on their Almoner’s Committee, assisting those in need. He resides in Yonkers and is a parishioner of Sacred Heart Church in Yonkers. Erin was raised in San Francisco Bay Area, the oldest of three children of Brandon and Gail (Campbell) Gregg. She graduated from the University of California/Santa Barbara with a B.A. in the History of Public Policy, and earned a Masters of Science Degree in Occupational Therapy from New York University.Erin works as an Occupational Therapist in a Senior Living Facility. She is also a Real Estate Agent with Keller Williams Realty. She is a member of Woodlawn Taxpayers Association and she currently serves as President of Women of Woodlawn. Erin and her husband, Jim Lee, who is a Fire Department of New York bagpiper, have two children, Fiona and Callum. They reside in the Bronx and are parishioners of St. Barnabas Church. Caroline was raised on the family vegetable farm in Loughrea, County Galway, one of four children of Johnny and Nancy Mahony. She arrived in the United Staes in 1992 and married her husband Leo Martin in 1998. While raising her sons Jack and James, and immersed in the Gaelic Athletic Assoc., she became involved with NY Minor League Hurling. She became Secretary of the Juvenile Hurling Div. and Le Cheile Hurling Club. In 2015, Caroline was awarded a Junior B County medal for helping to establish the first All American team. She organized the CYC 2014 parade in Yonkers, with participants from all corners of the USA and Canada. Caroline has been a development Officer for the NY Minor Board for the last four years, and Treasurer of the St. Barnabas Club. She has also attained a high degree in martial arts. She has worked as a horticulturist in the Hudson Valley for over 24 years. Caroline and her family reside in Pleasantville and are parishioners of Holy Innocents Church, where she has taught religon for over 6 years. Sean, a native of Crosserlough, County Cavan, is the youngest of seven children of James and Mary McEoy. After attending St. Mary’s in Crosserlough where he won football County Championships at the underage level, he attended St. Clare’s College in Ballyjamesduff where he also played football. After arriving in New York in 1980, he joined the Cavan Football Club and played for many years. In 1994, he opened J. C. Mac’s in the Bronx, and then in 2004 he opened Danny Mac’s in Yonkers. Sean married Julie Carey, a registered nurse with NY Presbyterian Hospital, in 1990. Their children, Katie and Sean, were both actively involved in underage football in Woodlawn as well as NCAA Div. 1 Track and Field Teams in College. Sean Sr. is a member of the McLean Avenue Merchants Association and Myles Scully Div. 1 AOH. He has remained involved with St. Barnabas GAA, St. Brigid’s GAA, Cavan Football Club and has been a coach and a sponsor for Woodlawn Boy’s and Girls Club. He plays darts on the Danny Mac’s team. Sean and Julie are parishioners at St. Barnabas Church. William was born and raised in Yonkers, the second of three children of William and Marie (Grady) Sullivan. His Irish roots trace back to great-grandparents from Counties Cork and Leitrim. After graduating Sacred Heart High School in Yonkers e went to work for the family business, Sullivan & Son Building Materials and Fuel Oil in Yonkers. In 1995, he changed careers and joined the Yonkers Police Department. He was promoted to Detective in 2006 and is currently assigned to the Intelligence Unit. As a member of the PBA, he has served on the Board of Trustees and Executive Board as Sergeant at Arms. He is also a member of the Fraternal Order of Police, the Police Emerald Society of Weschester and the Friendly Sons of St. Patrick Westchester. He has supported and attended every Yonkers St. Patrick’s Parade since joining the YPD, and many before that. William and his wife, Eileen have been married for over 26 years and have two children, Jacqueline and William III. They are parishioners of St. John the Baptist Church.